How fast will I get my seed? Orders are verified and processed within 24 hours. Shipping depends on product availability but usually ships within 48 hours. If you have express shipping needs, we’d like to talk to you in person Contact Us Here. 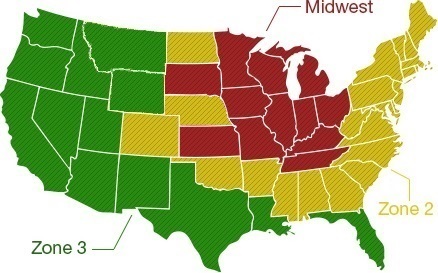 Why are prices higher outside of the Midwest? We are a Midwest based company! Although we use 6 different trucking companies, moving thousands of pounds hundreds of miles gets pricey. We offer an “exact freight quote” by Contacting Us here with your address and seed weight. How much $ does shipping cost? This year we shipped 1000 pounds to TX for $350 – so please contact us about an exact freight quote. We will update our shipping prices once the prices stabilize. We have 2 warehouses, one in Indiana and one in Illinios. Depending upon inventory and destination your seed will leave from one of these locations. We quote orders with 6 different trucking companies. The most reliable and affordable company is selected to deliver your seed. What days do you guys ship, weekdays and weekends? Warehouses are closed on Saturday and Sundays and holidays. Also, orders received after 10:00AM will not be shipped until next day. Do you make money on shipping? NO – Our goal is to charge only what we are charged. We are a seed company not a shipping company – we partner with 6 different trucking companies for transportation. Over the past 2 years we have actually lost money in shipping. Do I get billed again if freight + product costs more then what I payed? We keep our word, even if it is electronic! What you pay is the FINAL price. What if my seed is out of stock? If product is not available because of varying supplies, we will contact you about delays or available substitutes. We do strive to keep our website updated but accuracy varies as information is received from suppliers. Thanks for your understanding around this as we and our suppliers buy and sell seed throughout the year and inventories flex. Can you ship outside of the United States of America? ForageSeeds has tried to ship internationally but we have ran into multiple roadblocks. Because of this, we do not ship outside of the USA, but we have work with some to deliver seed to the trucking terminal closest to them. Absolutely. You can pay with cash, check, or money order (in addition to credit cards). Address checks to ForageSeeds.com and mail to 13601 Riley Rd | Bremen, IN 46506. Product will be shipped upon receiving payment.